Free download LockOnGallery for Nokia mobile. It is a security application for your Nokia mobile phones. As its name states, you can protect your phone gallery from unwanted access. If you want to secure all your photos, music and videos so that no one else can see them. This is the most efficient way of locking Gallery of your phone. Once locked, Gallery can be accessed only by entering a password for the valid user defined. It also comes with auto lock feature by which phone’s main screen is locked automatically if you do not use your phone for user defined time. 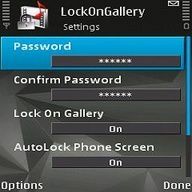 LockOnGallery is available for your Nokia mobile phone through OVI store. It is very simple and easy to install this app on your mobile device. Simply click on the link button below and then download and install this application. Nokia OVI store will automatically detect your mobile device and provide you the app LockOnGallery accordingly. After completing the whole process of downloading and installing, you can manage it. For example, you must have to change its access password. You can also change the auto lock time. This is the time after which your mobile gallery will be locked it you have not remain in touch with your mobile phone. Now you can keep personal and family pictures into your mobile phone without hesitation. You can install it on all your Symbian or Java based mobile phones.